You have so many items on your to-do list, let us protect your milk and deliver the margins. The traditional dairy milk cooling solution is what Paul Mueller Company set out to accomplish in 1955. After 63 years we have perfected the #1 best-selling solution on the market. At Paul Mueller Company we care about Cooling the World's Milk. 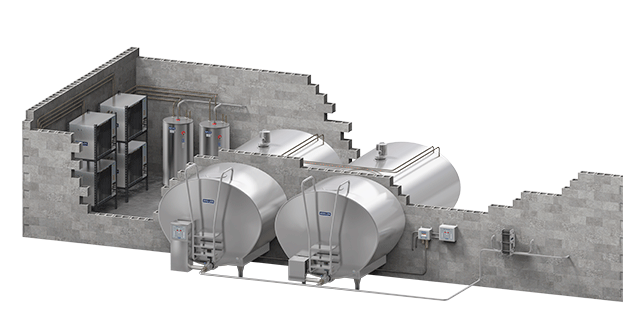 The Traditional Milk Cooling Solution consists of five main aspects: pre-cooling, storage, tank cooling, heat recovery, and wash. Pre-cool your milk within 2 degrees of your well water temperature prior to storing in the Mueller Milk Cooler. The E-Star HiPerForm Refrigeration unit, the heart of all Mueller Milk Cooling Solutions, will take it from there. As the E-Star removes the remaining heat from the milk it distributes it back into your potable hot water system. This equates to 135-155 degrees of free hot water in one of three sizes: 50 gallon, 80 gallon, or 120 gallon. After the milk hauler has picked up the 36 degree milk, the HiPerForm III wash control and it's fully customizable programs will take it from there.